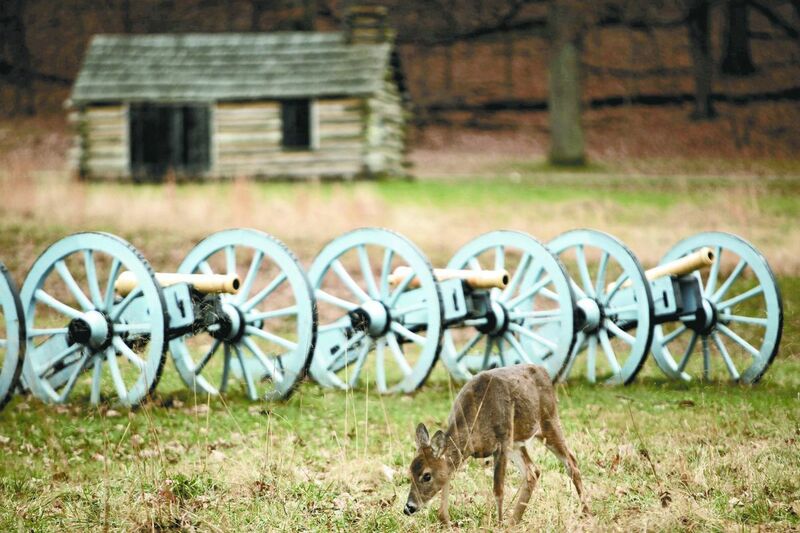 Valley Forge National Park, in Valley Forge, celebrated its 40th anniversary as a national park in 2016. The National Park Service celebrated its centennial last year. The Philadelphia region has seen an uptick in visitors annually for the last seven years, after a tourism slump in 2008 and 2009 due to the recession. A record 42 million out-of-towners came to the city and surrounding Pennsylvania counties in 2016, an increase of 2.4 percent from 2015, according to the group that works to attract leisure travelers. The Democratic National Convention last July provided "a bump, a big shot in the arm financially," said Fritz Smith, vice president at Visit Philadelphia, which tracks domestic tourism and travel. Beyond that, Philadelphia is evolving and getting better as a destination, with new hotels and new restaurants, he said. Collectively, events such as the DNC, Pope Francis' visit, and the NFL draft put Philadelphia on a national stage and "keeps us top of mind in visitors' eyes," Smith said. It was also a banner year for Center City hotels, with an average 78 percent occupancy. Moses Smucker, owner of The Grill at Smucker's in Reading Terminal Market. What were the top attractions in Philadelphia and the region? The Reading Terminal Market was No. 1, with 6.5 million tourists and locals stopping for lunch, browsing, and shopping. Independence National Historical Park saw 5.07 million visitors in 2016. The most frequented spots were the Liberty Bell with 2.3 million sightseers, and Independence Hall with 752,658 visitors. Outside the city, the big attractions were Valley Forge National Historical Park which drew 2.4 million, up nearly 14 percent over the 2.1 million in 2015. The National Park Service celebrated its centennial, and Valley Forge marked its 40th anniversary as a national park in 2016. The surge in attendance was consistent at all the national parks. "2016 was the most visited year for all the parks combined," said Jonathan Parker, acting park superintendent at Valley Forge. Other popular attractions were Peddler's Village in Bucks County, with 2 million visitors, and Longwood Gardens in Kennett Square, with a crowd of 1.35 million in 2016. The Philadelphia Zoo had 1.16 million visitors, and the Philadelphia Museum of Art hosted 775,043. The Please Touch Museum welcomed 480,355, and Eastern State Penitentiary opened its doors to 393,308. The Barnes Foundation saw 265,393 visitors, and the Academy of Natural Sciences counted 246,780. Other popular attractions included the Franklin Institute, which welcomed 877,000, and the National Constitution Center which sold 286,548 tickets. Some places are hard to quantify: the Rocky steps, which are the 72 steps at the entrance of the Art Museum, and the Rocky Statue named for the fictional Rocky Balboa of Sylvester Stallone's Rocky movies, attract tens of thousands of sightseers and photographers every year. Elfreth's Alley, the nation's oldest residential street, is just that — a public street. One trend spotted by local tourism officials since the DNC chose Philadelphia has been an increase in interest from the nation's capital. "The Washington, D.C., metro area has always been our third biggest feeder market outside of the New York metropolitan region, and the Philadelphia region itself," said Smith of Visit Philadelphia. "But it is growing in significance. We've resumed advertising in that area." The count for overseas visitors to Philadelphia, which comes through the U.S. Commerce Department, is not yet available for 2016, said the Philadelphia Convention and Visitors Bureau, which tracks international tourism patterns. "It was a very good year for hotels," said Ed Grose, executive director of the Greater Philadelphia Hotel Association. "A lot of it had to do with the DNC. We had a very good summer, and then we had some very good conventions, as well." Visit Philadelphia's regional tally comes from a national survey of where people traveled, combined with hotel stays, visitor spending, and tax revenues from restaurants, hotels, attractions, and retail establishments. Visitors spent $6.8 billion here in 2016, up from $6.7 billion the year before. "We have heavy repeat visitors," said Lauren Hansen-Flaschen, Visit Philadelphia's director of research and policy. "People come and they experience something and want to come back again and again. We're not just a summer destination. We see sustained activity, well into the fall, the spring is great, and even winter."